We offer hand dyed wool yarn for you to use on your next project from both Navajo-Churro and Rambouillet sheep. Browse our extensive selection of yarn here! Moisture-wicking, durable, fire resistant fleeces keep our flock warm through the winter. The sheep are happy to share their coats with you for your own creative projects! We offer pelts and hand-dyed yarns from two different types of sheep: Navajo-Churro and Rambouillet. Our extensive color selection was crafted to reflect the colors of northern New Mexico. Our Churro and Rambouillet yarn collections are hand-dyed using low-impact prepared powder dyes, a process that is well suited to the dry regions of the western US because it requires very little water. In addition, we regularly offer limited-edition batches of all-natural, plant-dyed yarns in both the Churro and Rambouillet collections. Check back often to see what new and exciting colors have just emerged from the dye pots! Click here to learn about our bulk yarn discounts. Our Churro yarn collection comes in two different weights, blanket and rug, which are roughly equivalent to worsted and bulky weight. These collections are ideal for large and small weaving projects—Churro yarns have long been the preferred choice for traditional Southwestern weavings. Due to the strength of the fiber, Churro weavings maintain their structural integrity well. Churro yarn is known for its lustrous quality, and its unique ability to absorb dyes creates a lively and robust color palette that is difficult to find in other types of yarn. Click here to view our Churro Sample Card. 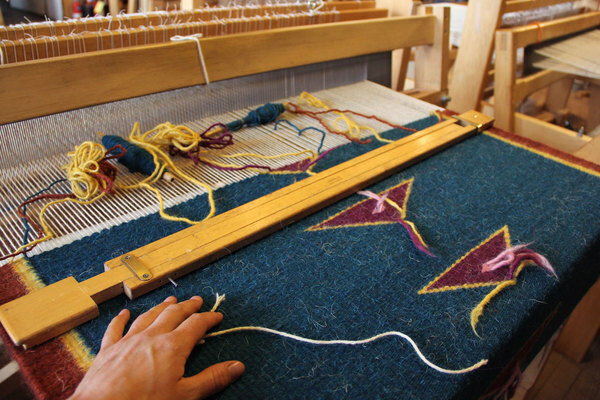 Below: Blanket weight (L) and Rug weight (R) tapestries made with Shepherd's Lamb Churro weaving yarn. Our Rambouillet yarn collection is a two-ply sport weight that is best suited to knitting, crocheting, and apparel weaving projects. A descendant of the Merino breed, Rambouillet sheep are known for producing exceptionally soft and lofty wool. Rambouillet yarn takes dye well, resulting in soft, colorful fibers that are an excellent choice for apparel items. Our Limited-Edition yarn collections are hand-dyed with all-natural plant dyes. These natural dyes are made with plant ingredients like blue aster, black walnut, cochineal, indigo, and yellow onion skins. The natural dye process is time consuming and labor-intensive: the yarn may be in the dyebath from four hours to two days depending on the desired color. Most of our natural dye materials are gathered by hand from the northern New Mexico region. Natural Dye collections are available in both Rambouillet and Churro. Due to the small-batch nature of our natural dye process, availability may vary.